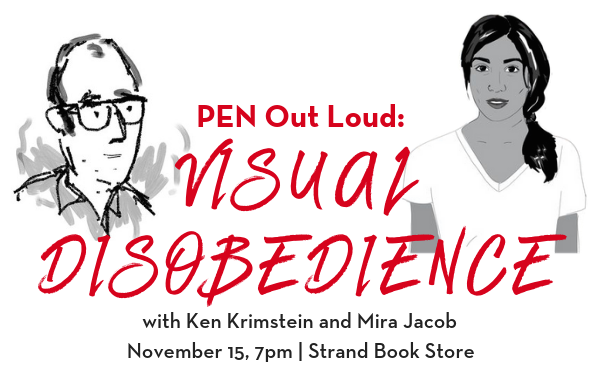 With New Yorker cartoonist Ken Krimstein, author of graphic novel The Three Escapes of Hannah Arendt, Mira Jacob, author of The Sleepwalker’s Guide to Dancing and the forthcoming graphic memoir Good Talk, and others to be announced. Mira Jacob is the author of the critically acclaimed novel, The Sleepwalker’s Guide to Dancing, which was a Barnes & Noble Discover New Writers pick, shortlisted for India’s Tata First Literature Award, and longlisted for the Brooklyn Literary Eagles Prize. In addition, it received an honor from the Asian Pacific American Librarians Association, and was named one of the best books of 2014 by Kirkus Reviews, the Boston Globe, Goodreads, Bustle, and The Millions. She is the co-founder of much-loved Pete’s Reading Series in Brooklyn, where she spent 13 years bringing literary fiction, non-fiction, and poetry to the city’s sweetest stage. Her writing and drawings have appeared in The New York Times, Guernica, Vogue, the Telegraph, Buzzfeed, and Tin House, and she has a drawn column on Shondaland.